3500 B.C.E. - 1500 C.E. Discover the pyramids of the Moche, the textiles of the Nasca, and the gold of the Inka. 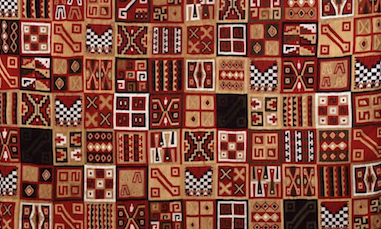 This culture flourished on the coast of Peru, producing art that reaches back more than 3500 years. Chavín de Huántar is an important archaeological site in the mountains of Peru with a massive temple complex that contains a fifteen-foot carved stone likely seen only by priests. The Nasca people inhabited one of the driest regions of the world. They made geoglyphs that are among the world’s largest drawings. Moche architects and artists raised spectacular adobe pyramids. Their ceramics and jewelry are naturalistic and rich in imagery, inviting us to explore their world. Luxury goods abounded in the Kingdom of Chimor, which controlled parts of the northern Peruvian coast for several centuries. Inka textiles, ceramics and architecture all reflect the power and ambition of their extensive empire. c.500 B.C.E. - c.1600 C.E. The Quimbaya and Tairona cultures from what is today Colombia used gold not as currency, but to assert the semi-divine status of their rulers. Golden beakers, mummy bundles, monumental palaces, and more.